Well we all know how painful a long haul flight is; therefore, I decided to have a mini break in Singapore from our Sydney to Prague travel. 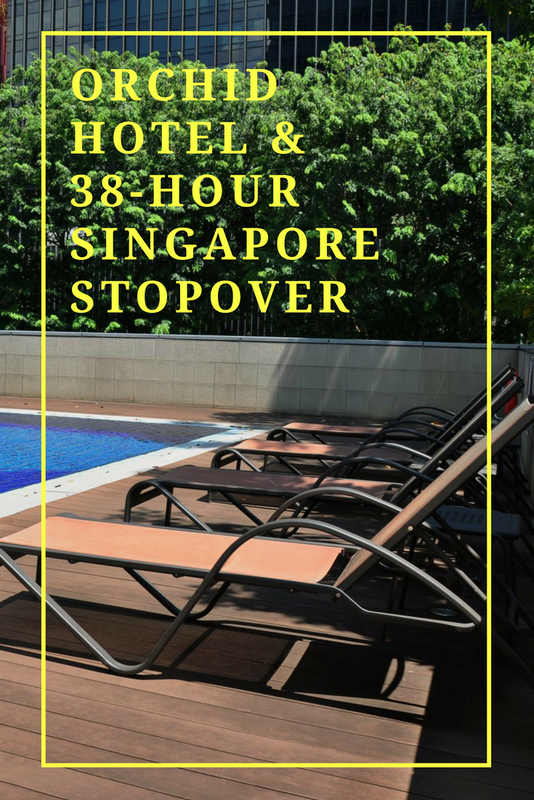 Arriving Singapore, we couldn’t be happier to start our stopover holiday, especially so for Kent, as it was his first visit to Singapore and he loved the heat which hit us as soon as we left the terminal. The challenge of this Singapore-Prague-Singapore trip was that we had to pack for both the tropical weather and spring time in Prague; which could be as low as zero degree Celsius in the morning, and we would be out in it… I won’t give too much away here so stay tuned. 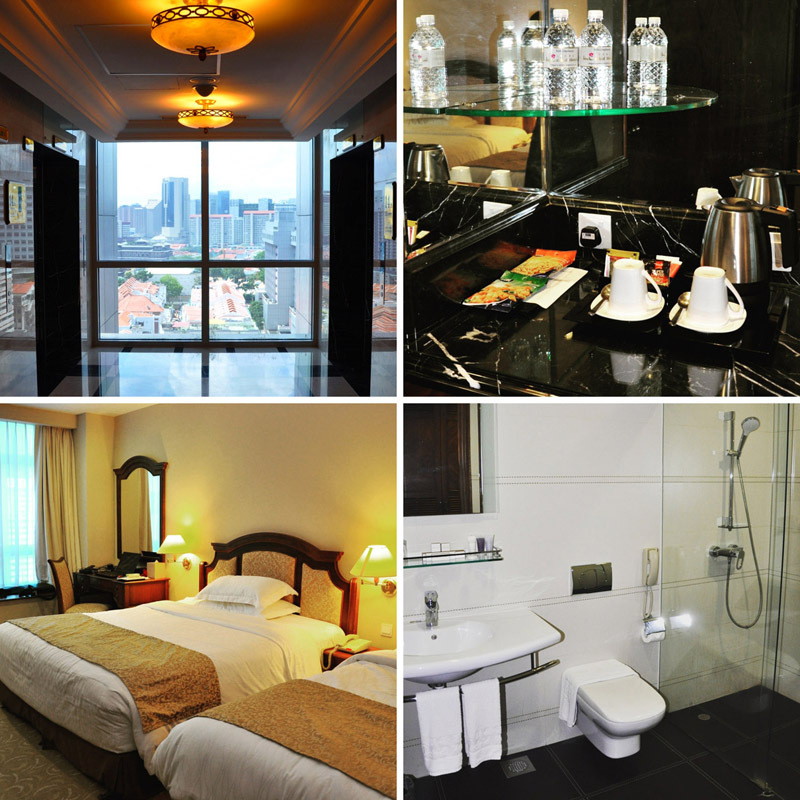 Our Deluxe Room at Orchid Hotel, Singapore. 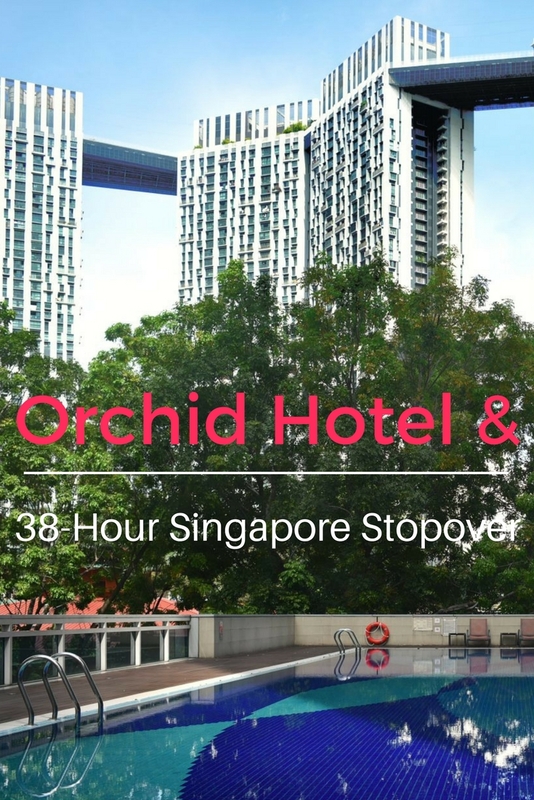 It was a smooth journey from landing to arriving our hotel – Orchid Hotel by taxi, confirming Singaporeans are efficient and polite. From the moment I booked the Orchid Hotel, I knew it’s not a fancy option, but we were impressed by how spacious (at approximately 32 square metres) and clean our Deluxe Room was. The room had a single bed and a Queen size bed, we had arrived late so we didn’t bother making ourselves tea or coffee. The bathroom was simple and clean: hotel slippers, hair dryer; bathrobe.., it had everything I needed. After the friendly bellman delivered our luggage, I couldn’t wait to jump into the shower. As for Kent, he was also aiming for an early night so he could get up early the next day to start exploring the city. Enjoying our outdoor lunch in Chinatown Food Street, Singapore. 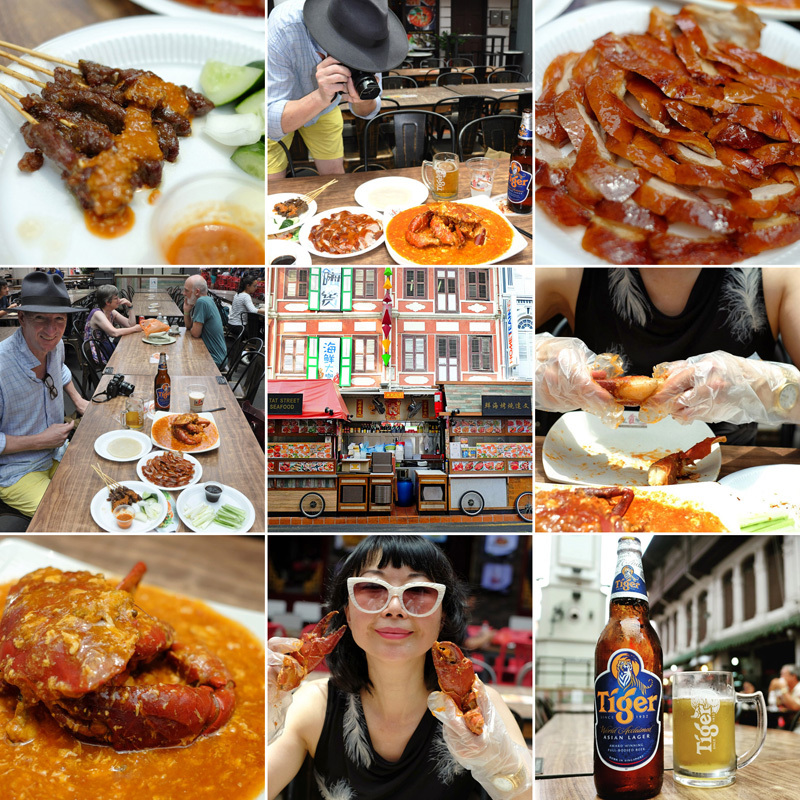 Visiting Singapore equals a feast of Singapore Chilli Crab to me, as having Chilli Crab remains one of my most memorable Singapore experience from my last visit 15 years ago. To share this experience with Kent, I suggested having Chilli Crab for our lunch. The it place for Chill Crab Kent had found online, unfortunately only opened for dinner not lunch. So we then decided to wonder about in old Chinatown and see what options popped up. And we were spoilt by choice. We soon realised that there’s not much point searching for the ‘best restaurant’ or the ‘best food stall’ – they all looked so good. So we picked a comfortable spot in the outdoor common area and I set about ordering lunch. The star of our lunch – Singapore Chilli Crab was from food stall Boon Tat Street BBQ Seafood. Knowing that Kent has not been a big fan of crab in the past, ‘too much work’ as he said, I also ordered Roast Duck Pancakes (aka Peking/Beijing Duck) and Lamb Satay Sticks with Peanut Sauce from Yucun Kitchen. As you could see from these pictures above, it was something of a feast! Our food was second to none and just what I had remembered, the Singapore Chilli Crab tasted sweet and sour more than hot and spicy. Kent was amazed at the sheer size of the crab and that there was plenty of meat that was both easy to get at and very tasty. So a win there, someone who was not a crab fan also enjoyed Singapore’s not chilli Chilli Crab. We thought the design of Singapore Chinatown Food Street was very smart, it retained the ambience of street food market yet totally modern and under cover; the fans definitely bring customers much needed breeze, especially eating in the 35C tropical heat! Well it actually hit 36C that day, so what better place to be than the swimming pool? Plus it was a much needed light exercise after a feast, and we were delighted to have the entire pool to ourselves in the late afternoon. 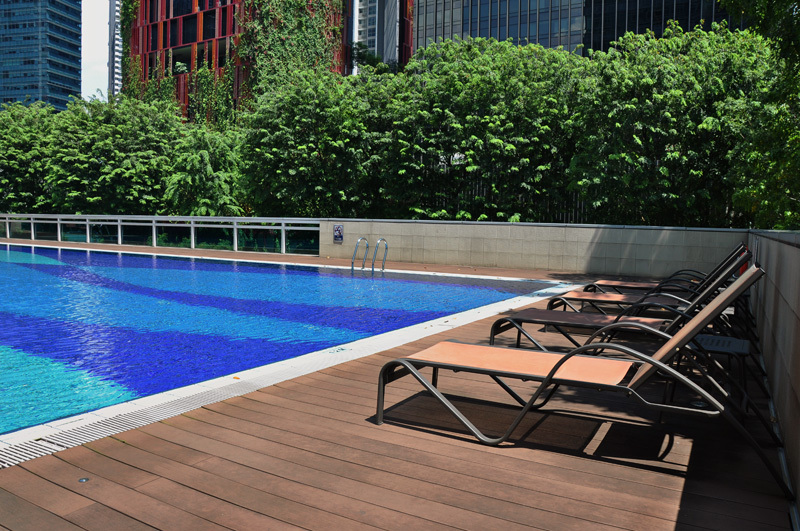 Pool towels were supplied by Orchid Cafe which was on the same floor. The water was pleasantly warm and the level of water only came up to my chest, with no deep end! 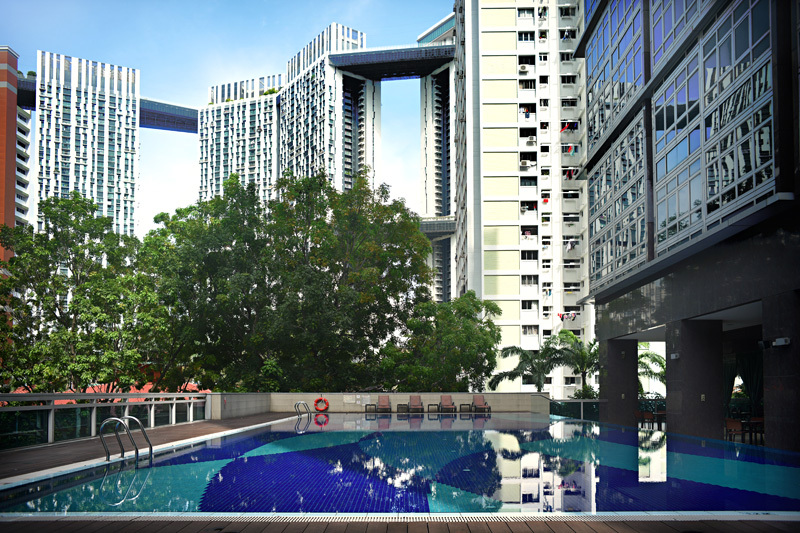 For someone like myself who is not a good swimmer and uncomfortable in deep water, this pool really suits me perfectly! Oh, have I mentioned that the view from our pool was gorgeous?!! Yes a buffet, it seemed like a less than fancy option; and yet again, we were impressed by what was offered. 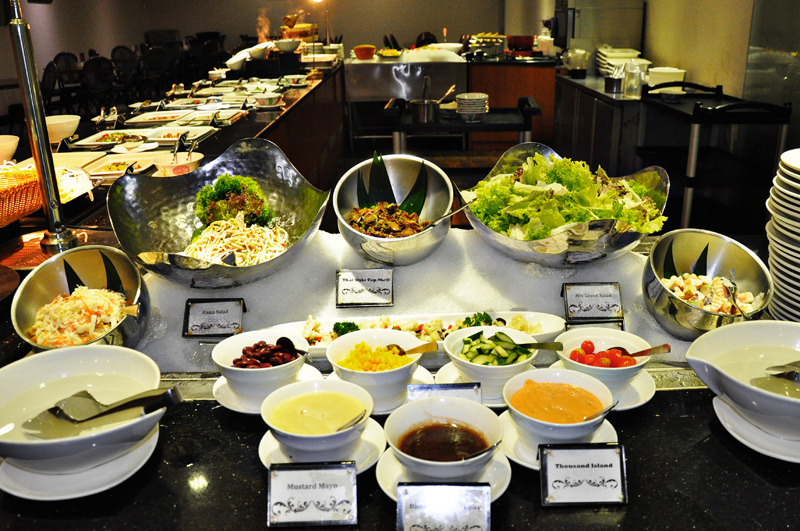 The Orchid Cafe‘s buffet focused on Singaporean flavours and not short of local street food in hawker style. Personally, I loved the Teo Chew rice congee. Even though it’s a buffet, all the food we tried including the steamed fish was cooked to perfection! I just wish I had more room to fit more of the selection in. Kent thought it was the ‘best value meal’ he had had for a long time. So maybe the buffet is back, “never judge a book by its cover”! 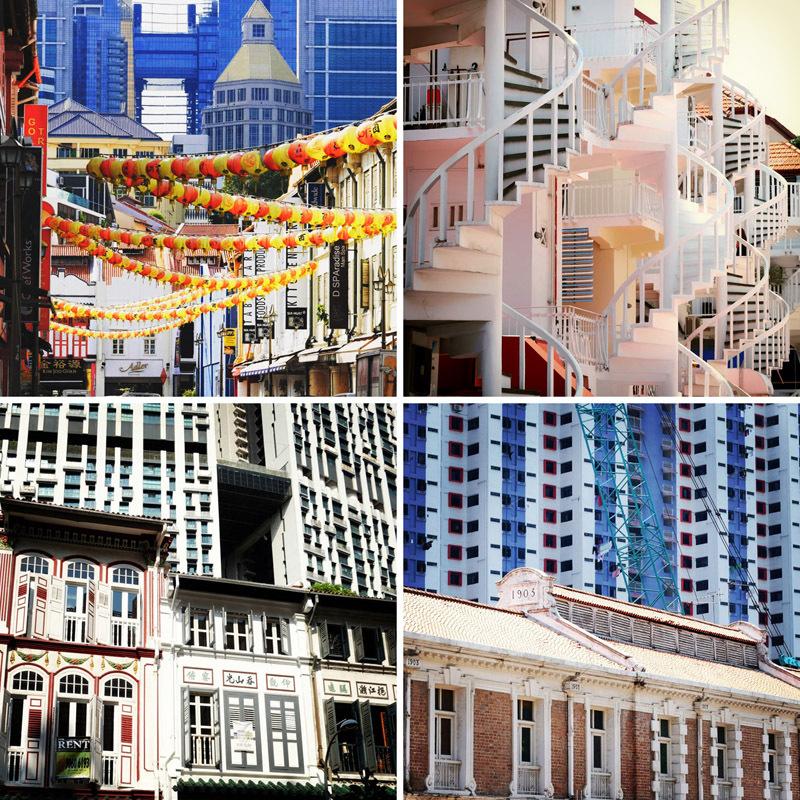 The patterns of Singapore: something old, something new. Australians love strong Italian style espresso coffee, so Kent had made it a mission to find ‘good coffee’ pretty much from day one. He discovered this nice coffee shop Joe & Dough the morning before. Good coffee, nice croissant and friendly smiles from the staff, what a great way to start our day! It’s only a short distance from Orchid Hotel on the edge of the Outram district. My real mission before we left Singapore for Prague, was to have Kent try durian as he has never tried durian before; ever! 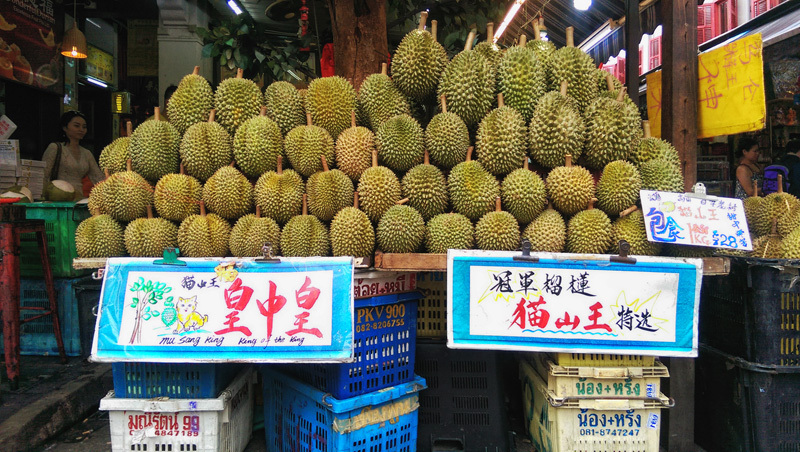 And you simply cannot complete a Singapore experience without trying the king of fruits – durian, agreed? So we set out on our final morning to find a stall selling durian in the old Chinatown markets that we had passed looking for Singapore Chilli Crab the day before (see picture below). Funny enough, although the stalls were closed and covered by blue or green covers which Kent pronounced ‘polytarps’… We thought it would be hard to find that stall in the labyrinth of streets. Which it was until, well the distinct smell of durian led our way! Unfortunately although we had uncovered the stall and someone working there told us that they could not sell us durian till opening time – too late. Time had run out, we had to return our hotel and finish our packing. Although we were not able to fulfil our, or my durian mission this time around, it’s a great excuse to come back to Singapore. As Kent happily snapped away with his camera during our stroll back to the hotel, I tried to take in the colonial beauty of old Singapore as much as I could. I love Chinese food, it’s the best! Great take on Singapore; love it! And what a cool pool.